Paul George has come full circle _ and he wants more. 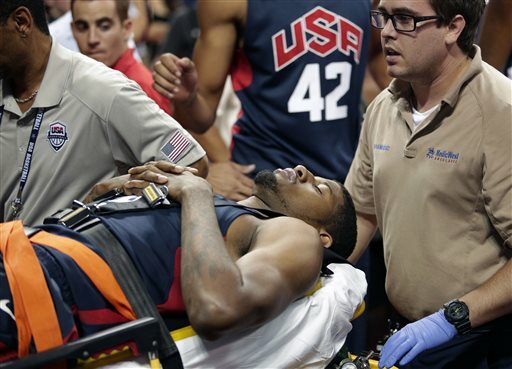 The Indiana Pacers All-Star was wearing the blue USA uniform in August 2014 when he suffered a gruesome injury on national television, snapping his right leg during an exhibition scrimmage. Now two years later, once again wearing all blue with USA across his chest, George planted that same leg on the floor and stepped on to the Olympic podium, arms interlocked with his American teammates, to receive a gold medal. Team USA rolled past Serbia 96-66 Sunday in the Olympic final to bring closure to one of the worst chapters of George’s life. The injury was so horrific there were concerns that the 6-foot-9, 220-pound forward would never be the same, he would lose some of his quickness, agility, explosiveness and athleticism. George worked to get back, and the work paid off _ in gold. George, arguably, was the best all-around player for the Americans and certainly the best defender. He took it upon himself to take Serbia’s best player, Milos Teodosic, out of the game. Looks of relief and satisfaction were all over his face following the medal ceremony. But maybe not to his Olympic story. 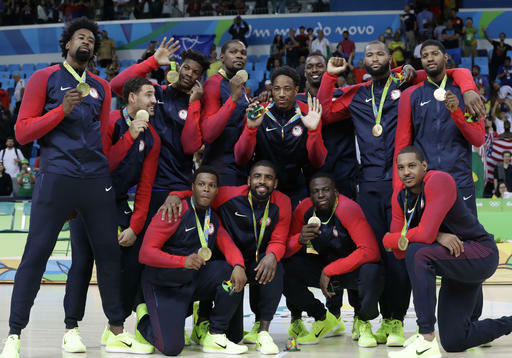 The construction of Team USA will look different in four years at the Tokyo Games. Krzyzewski will be gone. Carmelo Anthony said he’s done. LeBron James has expressed interest in returning and George will only be 30 years old.